This is a 25 year old woman with moderate acne scarring and active breakouts. 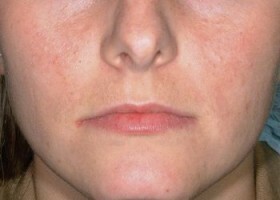 After implementing a skin care routine to control the breakouts, she underwent a series of five fractional laser treatments to resurface the scarred skin, and heal each scar from the inside out by stimulating collagen production mimicking the natural healing process that occurs to heal any other type of scar. Each treatment took about 30 minutes, and in most cases, makeup can be applied the next day to cover any residual redensss. The treated areas looks as if they are sunburned for approximately 4-5 days, but can easily be disguised with a gentle mineral foundation so there is no need to miss work or school to have a procedure like this performed. The treatments are spaced 3-6 weeks apart depending on how the skin reacts to each one, and the intensity of each treatment is gradually increased for the quickest results possible. Of course the most important goal to accomplish before you begin acne scar laser treatments is to idenify and remove all poor skin care habits, and to develop a quality home skin care routine. A healthy diet, exercise, drinking plenty of water, not wearing excessive heavy makeup, removing makeup before going to bed, and oil-control products are all key to keeping breakouts under control, and all should be implemented to prevent new scars from forming. Before and After laser treatments for acne scars in New York by Laser Skin Care Specialist Dr. Nicholas Vendemia, a plastic surgeon in New York City at MAS. If you would like more information about laser skin care options please give us a call at 917-703-7069 or send us a message by clicking here.